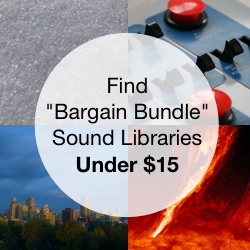 Questions about purchasing sound effects from the Airborne Sound store? We are here to help. Still have questions? contact us. We will help you. What currency does the website use? The products are listed in US dollars. We accept payments from Visa, MasterCard, and American Express. Click the bundle’s green "Add to Cart" button. This will add it to your cart. Repeat for any other bundles you want to add. Note: this changes the number and price of packs in your cart (menu bar, upper right). 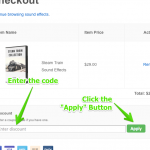 Click the menu bar cart image or the green "Checkout" button to visit the checkout. Enter your email address, name, and payment info. Note: If you are paying with PayPay, you will leave Airborne Sound temporarily to pay securely, then return. 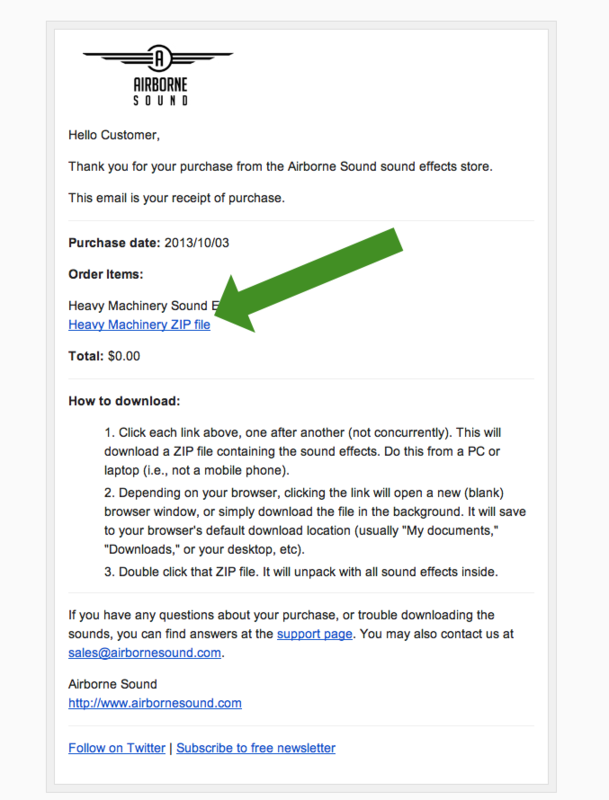 You will see the Airborne Sound purchase confirmation page. Your bundles will be listed at the base of the page, with links. Click the link to download the sound effects. You will also be sent a confirmation email with the same link (check your spam folder if you can't find it right away). You may download it from either location. Note: the link expires after three downloads, or 48 hours. If you run into problems downloading, contact us. I will get you your files. 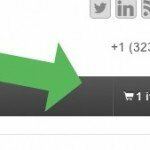 Click the green "Add to Cart" button, as described above. On the checkout page, you will see the text "Have a discount code? 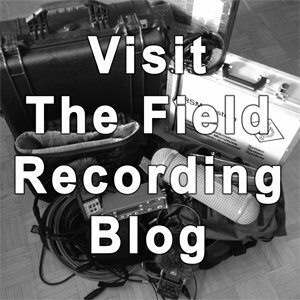 Click to enter it" beneath the sound libraries in your cart. Click the "Click to enter it" text to reveal the discount code box. Click the "Apply" button. The prices will be adjusted. 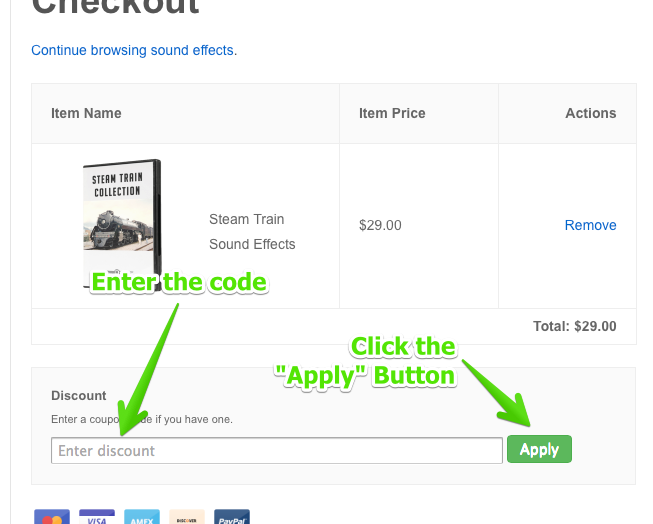 Proceed with the checkout process as described above. Sometimes PayPal takes a second or two to catch up with the store. Wait a few moments and refresh the page. Your links will display. You will also be sent links via email. I want to share a sound library on a network with other editors. What is your multi-user pricing? Our sound libraries provide a single-use licence for one person. A multi-user licence is required to share a sound library on a network with others. An additional copy of the copy must be purchased for every editor that has access to the sound library. Discounts are provided for every additional purchase beyond the first. Please email us to purchase a multi-user license. I haven’t received my order email. Order emails are sent immediately after your order is confirmed. If you cannot find it in your inbox, please check your spam folder, it may be there. Please note that Microsoft often blocks our emails to MSN and Hotmail email addresses. If this is the case, order from another email address, or contact us with an alternative email address. How do I download the sound effects? There are two ways to download your sound effects. After payment you'll be displayed a confirmation page. There are links to your sound effects at the bottom of the page. Click each link below, one after another (not concurrently). This will download a ZIP file containing the sound effects. Do this from a PC or laptop (i.e., not a mobile phone), and avoid using download manager software. Depending on your browser, clicking the link will open a new (blank) browser window, or simply download the file in the background. It will save to your browser's default download location (usually "My documents," "Downloads," or your desktop, etc). Double click that ZIP file. It will unpack with all sound effects inside. You'll also receive a confirmation email invoice (check your spam folder if you can't find it). This will list your purchase, and also include a link (example in image to the right). Click each link in the order email, one after another (not concurrently). A new (blank) browser window will open, and your sound effects will begin downloading a ZIP file immediately. Note: for best results, download files one after another (not concurrently). Otherwise, it may clog your internet bandwidth. My download manager software can’t download the libraries. Please do not use download manager software for downloading the sound effects. They do not work with our system. Download managers may time out or expire the library links prematurely. Download managers send multiple requests and create multiple connections to the server. Each of these connections count as a download. Airborne Sound will receive a large amount of requests to download the sound fx and may result in exceeding the download limit. If this has happened to you, please contact us and we will send you new links. My download link doesn’t work. The download link expires after three download attempts, or 48 hours. If your link doesn't work, contact us with your purchase email address. We will get the sound effects to you. I can’t download the sound effects to my iPad or iPhone. The sound effects are combined together in one compressed ZIP file. Most tablets and smart phones cannot understand the ZIP format. Download the sound effects to your desktop or laptop computer, then copy them to your iPhone or iPad. If you don't have a desktop computer, please contact us. We will get you the sound effects. After downloading, you'll find the sound effects ZIP package in your browser's default download location. In most cases this will be a Downloads folder, My Documents folder, or on your Desktop. Can you ship my sound effects to me? 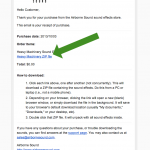 Airborne Sound provides downloads only. Sometimes it takes time to download your sound effects, especially for large collections. Airborne Sound is happy to refresh your links at any time. Contact us and we will help you. I have downloaded the ZIP file. How do I access the sound effects? Your sound effects will download via one or more compressed ZIP files. After your ZIP files have downloaded, double-click each one. Each ZIP file will open, and create a new folder. All clips will be inside. How can I use the sound effects? Read details in the end user license agreement. Visit the Sound Effects Use Guidelines. The sound effects must be in timed synchronization with other media. This means they must be combined with other audio or video in a timeline, and cannot be separated from them. In other words, they must become become part of a larger composition. They cannot not be used solely on their own. The clips cannot not be redistributed or shared with others, even free of charge. The sound effects are royalty-free. That means that you can use the clips as many times as you like, in as many projects as you like, without additional fees beyond your first payment. Please note: this is often confused with "free of charge" or "transfer of ownership." 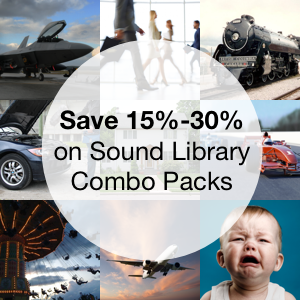 Airborne Sound retains all rights and ownership of the sound files. Still wondering how to use the sound effects? Our Sound Effects Use Guidelines answers the most common questions of how you can and cannot use the sound effects. It also includes explanations of how the sounds can be used in projects, and general sound clip copyright questions and answers.